On the Roadshow we have been in Cinemas so it seemed appropriate to have a round of IT professional's film club, an idea which we lifted from Radio 4's "I'm sorry I haven't a clue". I've never really taken to any other Radio station: I can remember asking my grandmother why "Just a minute" had that "very fast piano music" (The Minute Waltz) as a signature tune. On "I'm sorry I haven't a clue" Humph's fantastically contrived double-entendres and good natured insults are exactly my sense of humour. As one of the many tributes from the public posted this morning on the BBC web site says, "Not having to pull over due to crying with laughter will mean the roads will be safer now, unfortunately." 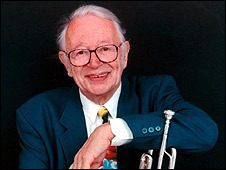 So it was a bombshell to hear, on Radio 4 as I woke up this morning, that Humphrey Lyttelton has died It seems too small a thing to say "I'll miss him". But I will, terribly. Perhaps it’s because I’m an American jazz fan who admired Humph first and foremost for his music — his playing and his intelligence — that I find the tributes to him as the hilarious chairman of this show somewhat befuddling. I’ve written my own brief piece on my blog ("Jazz Lives" at WordPress.com) which might seem a minority view.